•Ridership on Opening Day on Monday was 5,787 boardings. In 2012 on Opening Day there were 4,326 boardings. •Ridership so far this season is 9,750 boardings for three games — the exhibition game against the Angels last Friday and two games against the Giants. Ridership at this time last year was 7,157 after two exhibition games and two regular season games. Another very big crowd is expected for tonight’s 7:10 p.m. game against the Giants, the rubber game of the opening three-game series between the two teams expected to contend for the western division title. 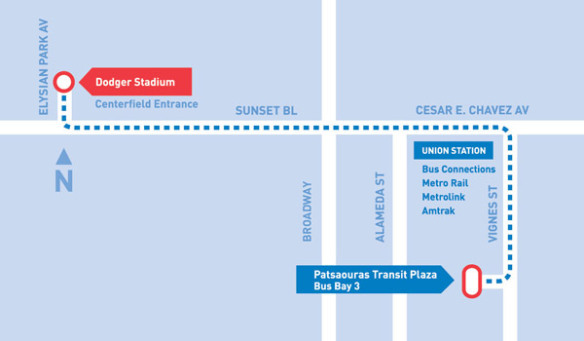 •Board the Dodger Stadium Express at Bus Bay 3 of the Patsaouras Transit Plaza at Union Station. The plaza is at the other end of Union Station if you enter on Alameda Street. •Service leaves Union Station every 10 minutes, starting 90 minutes before game time through the 3rd inning for all home games. We recommend arriving early; crowds are heaviest near game time. Driving to Union Station to connect with the Dodger Stadium Express? Beat traffic on the 10 and 110 freeways with Metro ExpressLanes. They’re toll-free for carpools, vanpools and motorcycles; solo drivers can use them too, by paying a toll. All users except motorcycles need a Fastrak® transponder. Learn more at metroexpresslanes.net. Pay for parking before returning to your car. Use the automated machines located in the elevator lobbies of P1, P2 and P3. Steve, do you have any figures for the drive times now that there’s a dedicated lane? I’m curious to know what it took last year vs. this year. I don’t have those but I’ll ask around. I haven’t been on the shuttle. Readers: how’s the travel time on shuttle so far this year compared to last? It says ‘leaves Union Station every 10 minutes’ for 90 minutes prior to the game. Once a bus is ‘full’ does it still wait for the rest of the 10 minutes? If 2 busses are planned for each 10 minute period, wouldn’t it be ok to let full busses leave early? Gotta get to the stadium this year. Metro to DSE sounds great for me. My understanding is they don’t let the buses fill up all the way because the buses may also make one extra stop en route and there needs to be space. So, generally speaking, the buses will be leaving every 10 minutes. I boarded at 11:15 AM on Opening Day and it took 18 minutes door-to-door. Passed lots of cars at a standstill on Sunset. It took us an hour last year for the home opener because the bus was stuck with the rest of the traffic. This year was a lot smoother, only 15 mins! Love it! I’ve taken it twice this season (both night games) and each night the travel time was between 18-22 minutes. Its a vast improvement from what I remember last season, but I only rode it a couple times last year. It would be much fast if the entire dedicated lane was delineated. Even though CMS boards read “Bus Only,” cars would drive in the lane until the delineated portion just west of Figueroa. The ride from Vignes to Fig is pretty slow, but all in all it was pretty good. Steve, there hasn’t been any extra stops. Both nights, either once the bus was full or once there were no people waiting to board, the bus departed for the stadium. My entire “commute” to a Dodger game from the Del Mar Gold Line Station is about 40-50 minutes. Thanks for the great website. I work for the Gold Line Extension contractor and I really enjoy reading about various Metro happenings. Can a bike rider use the dedicated lane to the Stadium?